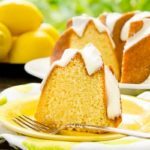 Triple Lemon Bundt Cake is a moist, homemade-from-scratch cake flavored with lemon zest, soaked with lemon glaze, and another lemon glaze drizzled on top. Preheat oven to 325°F. Grease and flour a 10-cup bundt pan. Beat butter in a large bowl until creamy. Place granulated sugar and lemon zest in a small bowl. Use your fingers to rub sugar and zest together. This will release lemon oil for better lemon flavor. Gradually add lemon sugar to butter, beating until light and fluffy. Add egg yolks one at a time and beating well after each addition. Add flour mixture in 3 additions alternately with milk in 2 additions, beginning and ending with flour mixture. Whisk together confectioners sugar and lemon juice until combined and there are no sugar lumps. Use a wooden skewer to poke holes about 1-inch apart in the warm cake (right out of the oven and in the pan). Slowly spoon soaking glaze over cake. Cool cake in the pan for 10 minutes. Remove cake from pan and place on a wire rack to cool completely. The cake bottom will be very soft from the soaking glaze. You may want to place a sheet of parchment or non-stick aluminum foil between the cake and wire rack to keep the cake from sinking into the rack (only for racks with 1/2-inch or more gaps between wires). Stir together confectioners sugar, butter, lemon juice, and 1 tablespoon milk. Add more milk, about 1/2 teaspoon at a time, as needed for drizzling consistency.